In quantum mechanics, an excited state of a system (such as an atom, molecule or nucleus) is any quantum state of the system that has a higher energy than the ground state (that is, more energy than the absolute minimum). Excitation is an elevation in energy level above an arbitrary baseline energy state. In physics there is a specific technical definition for energy level which is often associated with an atom being raised to an excited state. The art works of Daniel Lergon are executed with oil on canvas but in this case with one pigment only, a phtalogreen, on a yellow fluorescent backdrop. This is exactly what happens with the fluorescent neon colour … the molecules get into an excited state and emitt more light than natural. For his first solo exhibition in Poland, in Szczecin, Daniel Lergon, presents a series of new paintings at Galeria R+ and very large retroreflective painting, measuring 130x1040 cm, from 2013 at Rektorska Gallery. In the two rooms of the Gallery R+ several works are exhibited that confront us with a strong yellow and green glow. The works have a similarly ‚charged’ background as Lergon’s previous series. In former times, reflective fabrics and metal surfaces which had physical and chemical potential were used and painted upon and that potential was then unleashed. In this case we now have a neon surface and its light and brightness and colour is being modulated by the phtalogreen paint that covers it. 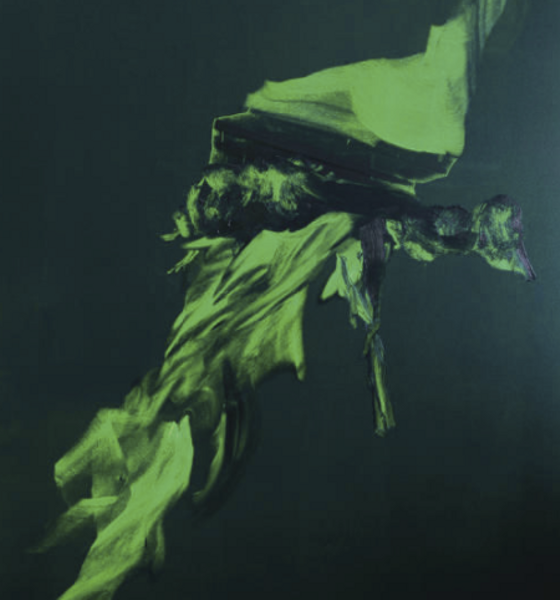 Some of the works have a bright and shining greenish backdrop onto which Lergon placed the compositions and forms, others have a dark green, almost black background which Lergon then scraped away and covered again, resulting in a play with the phtalogreen’s broad spectrum of greens, ranging from a bright, toxic glow to a velvety black. Only on the side of the painting is the original yellow ground visible – creating a radiant aura around the work. The compisitions and forms oscillate between a sort of fragmentary figuration and the traces and dynamics of the painterly process. The art work showed at Rektorska Gallery plays with the afromentioned potential of reflection and the spectator’s movement in front of it, and two copper paintings with their chemically altered surface. Born in 1978. Lives and works in Berlin. 2000-2006 studies with prof. Lothar Baumgarten at Berlin University of the Arts. Presented his works at solo exhibitions e.g. in Rome, Cologne, Brussels, Vienna, Madrid, Paris, Copenhagen, Berlin and participated in several group exhibition in such cities as Los Angeles, Dresen, Athens, Istanbul, Mumbai, Buenos Aires, London, Venice, Berlin, Cologne, Poznan.